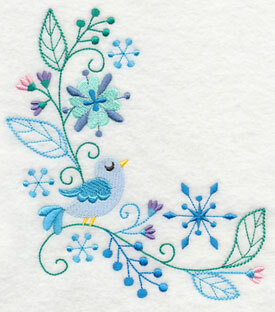 Let a flurry of feathers land on your next embroidery project! 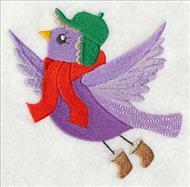 New designs feature the beauty and whimsy of winter birds in an amazing variety of shapes and styles. 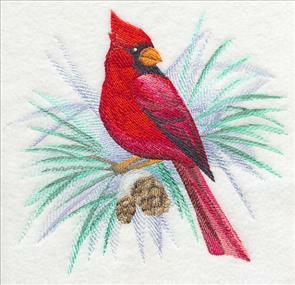 Whip up a pillow adorned with a watercolor cardinal, or stitch a stuffed chickadee to hang in your window. 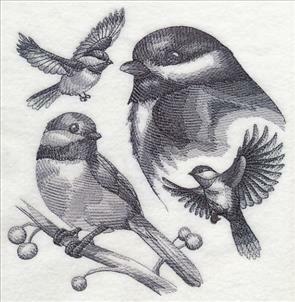 Bird trios are fabulous on t-shirts and sweatshirts. 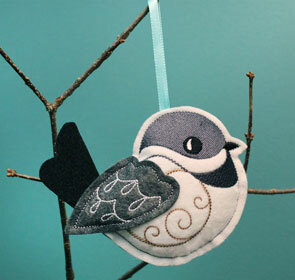 Plus, bird sketches, whimsical birdhouses, and a realistic winter bird scene, too! 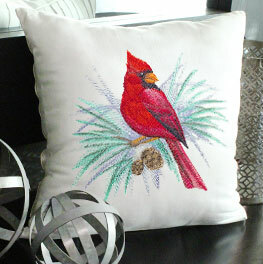 like this beautiful throw pillow. 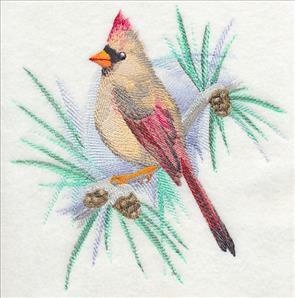 Gorgeous watercolor cardinals evoke the look of a hand-painted masterpiece. Frame the designs to continue the theme even further, or add to quilts and pillows for a sophisticated update to home decor. 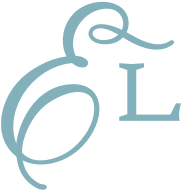 7.79" x 7.37" and 7.08" x 6.87"
7.69" x 7.77" and 6.88" x 6.94"
5.83" x 5.88" and 4.85" x 4.86"
A blue jay and chickadee are just as stunning sitting perched on winter branches surrounded by berries, pinecones, and greenery. 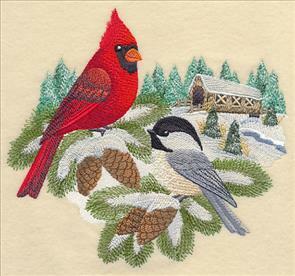 The light stitching makes these designs a beautiful fit for neutral, low-nap fabrics. 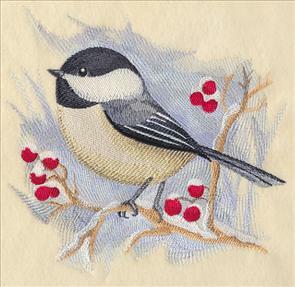 7.78" x 7.56" and 6.90" x 6.92"
7.77" x 7.58" and 7.06" x 6.84"
5.99" x 5.79" and 5.14" x 4.86"
The chickadee is a well-known winter bird; downy woodpeckers are also native to the cooler months. 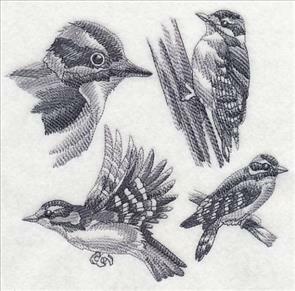 Here the magnificent birds are depicted in four different poses, and have been digitized in the classic sketch style. Great on pillows, totes, and more! 7.60" x 7.78" and 6.83" x 7.00"
7.26" x 6.90" and 6.16" x 5.85" and 5.09" x 4.82"
A cardinal and chickadee perch in the snowy forest near a traditional covered bridge. 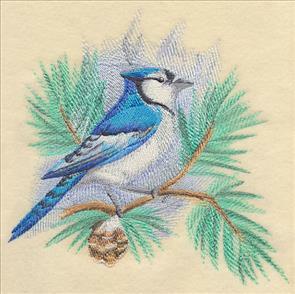 This detailed, realistic scene is the perfect choice when looking for a more life-like embroidery design -- try it on pillows, tote bags, and more! 7.52" x 6.90" and 6.39" x 5.84" and 5.28" x 4.83"
Light winter foliage, snowflakes, and sweet birds shine in these fun designs. 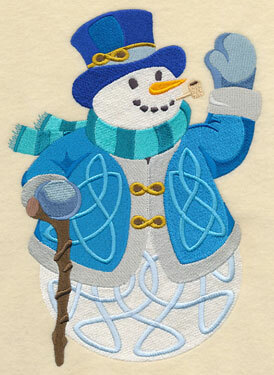 A mix of thinner and thicker stitches adds interest and depth to the whimsical designs, while a frosty color palette keeps the winter theme alive. 7.55" x 7.79" and 6.89" x 7.10"
5.86" x 6.04" and 4.86" x 5.01"
5.21" x 11.75" and 4.17" x 9.40"
3.47" x 7.81" and 3.05" x 6.85"
A matching border is a stunning complement to the wreath and spray designs above! 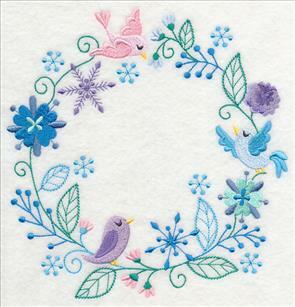 Stitch with the other flurry of feathers designs to create a quilt or a set of bed or table linens, or use alone on placemats, the bottom of shirts, or on tote bags. 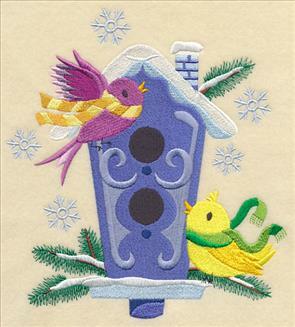 11.75" x 3.27" and 9.40" x 2.61" and 7.80" x 2.16" and 6.86" x 1.92" and 3.77" x 1.21"
These colorful corner and accessory designs feature sweet birds surrounded by frosty foliage, and are the perfect choice when adorning pockets, napkins, or other small areas. 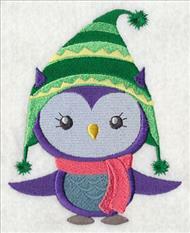 Order these frosty feathers designs individually by clicking the links above. Four sizes are available to suit any project. Birds are known for their beautiful voices and bright cheery songs. 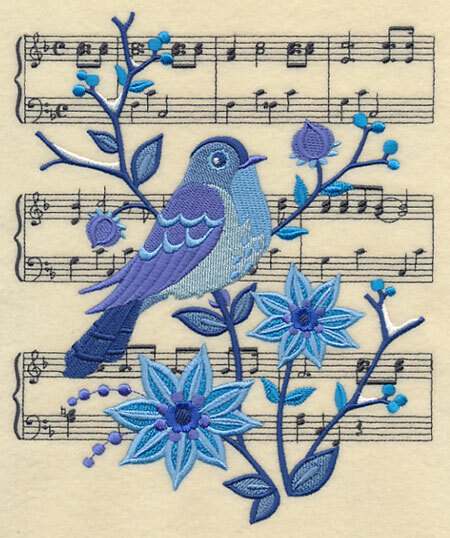 Here a blue winter bird is depicted in front of the sheet music for "Winter Wonderland," and is a stunning addition to pillows, tote bags, and more. 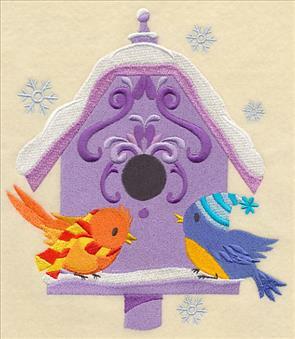 6.91" x 8.38" and 5.86" x 7.10" and 4.85" x 5.88"
Whimsical birdhouses full of sweet singing tweets are a fun and playful way to stitch for the season. 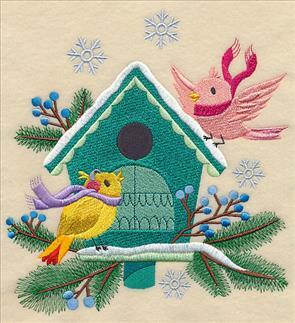 Abstract swirls and other fanciful details give these colorful birdhouses lots of charm. 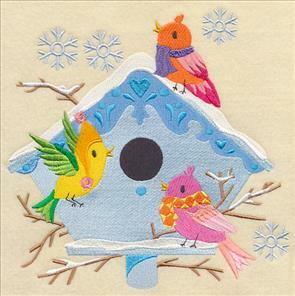 6.90" x 7.65" and 5.85" x 6.48"
6.91" x 7.47" and 5.86" x 6.33"
4.84" x 5.22" and 3.60" x 3.87"
Stitch the snowy birdhouses on wall hangings, mini-quilts, or tote bags. 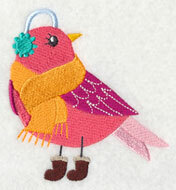 The bundled-up birds are a cute addition to any embroidery project! Greenery, snowflakes, and other winter accents add an extra-seasonal appeal. 6.90" x 7.83" and 5.85" x 6.64"
7.80" x 7.66" and 7.03" x 6.90"
5.96" x 5.85" and 4.97" x 4.88"
A trio of too-cute birdies dressed in cozy scarves, hats, and boots are ready to fend off winter's chill. 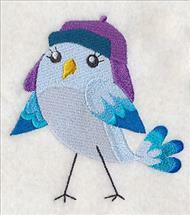 Stitch the sweet tweets on sweatshirts, t-shirts, and tote bags. Find out our best tips for stitching on sweatshirts in this fabulous tutorial. 11.75" x 5.34" and 9.40" x 4.27" and 7.80" x 3.55" and 6.85" x 3.12"
Each of the birds from this trio are available for sale individually, and are fabulous accompaniments to the design above. 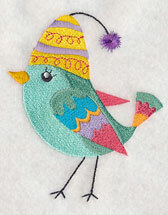 4.53" x 4.43" and 2.64" x 2.59"
Fun sweater-inspired patterns deck these winter birds with sweet style. 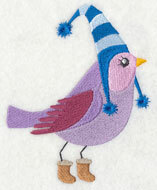 Their fabulous winter hats are sure to keep their heads warm. Stitch on a t-shirt, sweatshirt, or pillow! 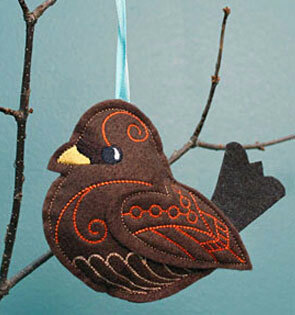 11.75" x 4.80" and 9.41" x 3.84" and 7.81" x 3.19" and 6.86" x 2.80"
These birds are also available to purchase singly. 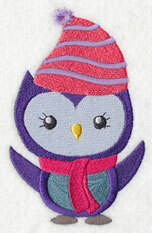 Use in conjunction with the trio above, or stitch on kids' gear, blankets, and more! 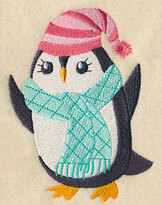 3.88" x 4.74" and 2.27" x 2.77"
These cute-as-a-button penguins are enjoying the snowiest season of the year! Colorful hats and scarves give them each a unique, bundled-up look. 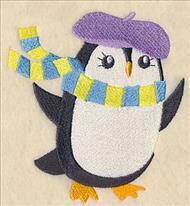 11.74" x 4.96" and 9.40" x 3.97" and 7.80" x 3.29" and 6.85" x 2.89"
Stitch each penguin on its own, too! They're especially terrific additions to onesies, burp cloths, and other kids' gear. 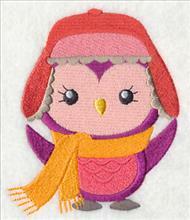 3.60" x 4.94" and 2.10" x 2.89"
Three wide-eyed owls are decked in winter's finest and ready to enjoy the cold! They're the perfect addition to sweatshirts and t-shirts. 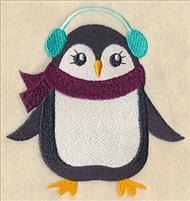 Learn more about stitching on sweatshirts in this helpful tutorial. 11.74" x 5.46" and 9.40" x 4.40" and 7.80" x 3.66" and 6.85" x 3.18"
These owls have been separated from the trio above and are available for individual purchase. Add to duffel bags, sweatshirts, and more. 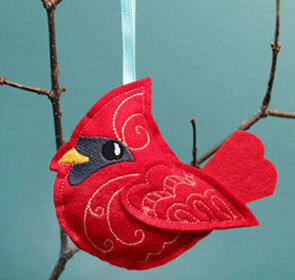 4.20" x 5.33" and 2.45" x 3.11"
Hang a too-cute chickadee or cardinal in your window, or from a light fixture in your home. 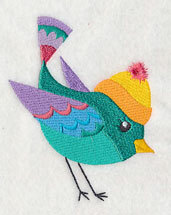 These stuffed birds are simply adorable, and surprisingly easy to make (they're put together almost entirely in the hoop!). Find out how in this brand new tutorial! 4.68" x 4.47" and 3.30" x 3.15"
Not only are these bird stuffies fabulous as home decorations, but they're terrific as gift toppers, ornaments, and toys, too! 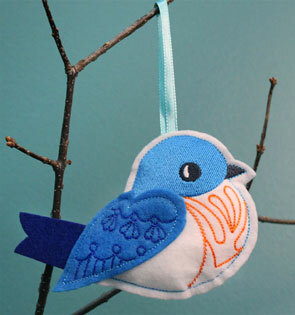 Here an Eastern Bluebird and Junco are shown with whimsical detail and so-sweet faces. 4.72" x 4.38" and 3.45" x 3.21"
Sandi requested a Celtic snowman design, and we thought a Celtic snowflake would be a fabulous match! 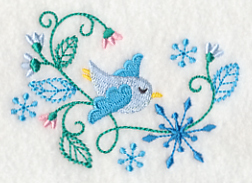 These winter wonderland motifs are a fabulous way to stitch for the season. 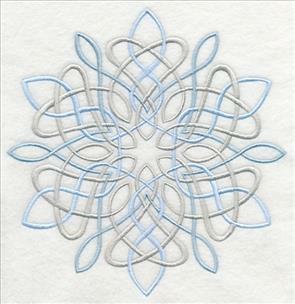 Use on wall hangings, tote bags, and more. 7.60" x 7.81" and 6.91" x 7.11"
5.86" x 6.03" and 4.88" x 5.02"